Dell had just acquired AppAssure earlier this week, adding the new company into its stable of Compellent, EqualLogic, Perot Systems, Scalent, Force10, RNA Networks, Ocarina Networks, and ExaNet (did I miss anyone one?). This is not including the various partnerships Dell has with the likes of CommVault, VMware, Caringo, Citrix, Kaminario etc. From 10,000 feet, Dell is building a force to be reckoned with. With its PC business waning, Dell is making all the moves to secure the datacenter space from various angles. And I like what I see. Each move is seen as a critical cog, moving Dell forward. Those are healthy numbers, but what’s most important is how Dell executes in the next 12-18 months. Dell has done very well with both Compellent and EqualLogic and is slowly bringing out its Exanet and Ocarina Networks technology in new products such as the EqualLogic FS7500 and the DR4000 respectively. Naturally, the scale-out engine from Exanet and the deduplication/compression engine from Ocarina will find these technologies integrated into Dell Compellent line in the months to come. And I am eager to see how the “memory virtualization” technology of RNA Networks fits into Dell’s Fluid Data Architecture. The technologies from Scalent and AppAssure will push Dell into the forefront of the virtualization space. I have no experience with both products, but by the looks of things, these are solid products which Dell can easily and seamlessly plug in to their portfolio of solutions. The challenge for Dell is their people in the field. Dell has been pretty much a PC company, and still is. The mindset of a consumer based PC company versus a datacenter-centric, enterprise is very different. Dell Malaysia has been hiring good people.These are enterprise-minded people. They have been moulded by the fires of the datacenters, and they were hired to give Dell Malaysia the enterprise edge. But the challenge for Dell Malaysia remains, and that is changing the internal PC-minded culture. Practices such as dropping price (disguised as discounts) at first sign of competition, or giving away high-end storage solutions at almost-free price, to me, are not good strategies. Selling enterprise products with just speeds and feeds and articulating a product’s features and benefits, and lacking the regards for the customer’s requirements and pain points are missing the target all together. This kind of mindset, aiming for a quick sell, is not Dell would want. Yes, we agree that quarterly numbers are important, but pounding the field sales for daily updates and forecasts, will only push for unpleasant endings. Grapevines aside, I am still impressed with how Dell is getting the right pieces to build its datacenter juggernaut. I have been in this industry for almost 20 years. March 2, 2012 will be my 20th year, to be exact. I have never been in the mainframe era, dabbled a bit in the mini computers era during my university days and managed to ride the wave of client-server, Internet explosion in the beginning WWW days, the dot-com crash, and now Cloud Computing. In that 20 years, I have seen the networking wars (in which TCP/IP and Cisco prevailed), the OS wars and the Balkanization of Unix (Windows NT came out the winner), the CPU wars (SPARC, PowerPC, in which x86 came out tops) and now data and storage. Yet, the last piece of the IT industry has yet to begun or has it? In the storage wars, it was pretty much the competition between NAS and SAN and religious groups of storage in the early 2000s but now that I have been in the storage networking industry for a while, every storage vendor are beginning to look pretty much the same for me, albeit some slight differentiating factors once in a while. In the wars that I described, there is a vendor for the product(s) that are peddled but what about memory? We never question what brand of memory we put in our servers and storage, do we? In the enterprise world, it has got to be ECC, DDR2/3 memory DIMMs and that’s about it. Why???? Even in server virtualization, the RAM and the physical or virtual memory are exactly just that – memory! Sure VMware differentiates them with a cool name called vRAM, but the logical and virtual memory is pretty much confined to what’s inside the physical server. In clustering, architectures such as SMP and NUMA, do use shared memory. Oracle RAC shares its hosts memory for the purpose of Oracle database scalability and performance. Such aggregated memory architectures in one way or another, serves the purpose of the specific applications’ functionality rather than having the memory shared in a pool for all general applications. I am a big fan of RDMA ever since NetApp came out with DAFS some years ago, and I only know a little bit about RDMA because I didn’t spend a lot of time on it. But I know RDMA’s key strength in networking and when this little company called RNA Networks news came up using RDMA to create a Memory Cloud, it piqued my interest. 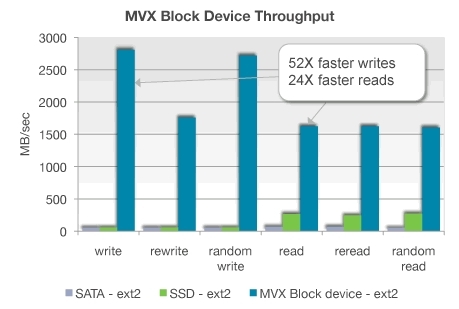 RNA innovated with their Memory Virtualization Acceleration (MVX) and this is layered on top of 10Gigabit Ethernet or Infiniband networks with RDMA. Within the MVX, there are 2 components of interest – RNAcache and RNAmessenger. This memory virtualization technology allows hundreds of server nodes to lend their memory into the Memory Cloud, thus creating a very large and very scalable memory pool. cluster see the global shared memory as their own main memory. can run one copy of the operating system. This test was done in 2009/2010, so there were no comparisons with present day server-side PCIe Flash cards such as FusionIO. But even without these newer technologies, the performance gains were quite impressive. The Memory Cache, as the name implied, turned the memory pool into a cache for NAS and file systems that are linked to the server. At the time, the NAS protocol supported was only NFS. The cache stored frequently accessed data sets used by the servers. Each server could have simultaneous access to the data set in the pool and MVX would be handling the contention issues. The Memory Motion feature gives OSes and physical servers (including hypervisors) access to shared pools of memory that acts as a giant swap device during page out/swap out scenarios. Lastly, the Memory Store was the most interesting for me. It turned the memory pool into a collection of virtual block device and was similar to the concept of RAMdisks. These RAMdisks extended very fast disks to the server nodes and the OSes, and one server node can mount multiple instances of these virtual RAMdisks. Similarly multiple server nodes can mount a single virtual RAMdisk for shared disk reasons. The RNA Networks MVX scales hundreds of server nodes and supported architectures such as 32/64 bit x86, PowerPC, SPARC and Itanium. At the time, the MVX was available for Unix and Linux only. The technology that RNA Networks was doing was a perfect example of how RDMA can be implemented. Before this, memory was just memory but this technology takes the last bastion of IT – the memory – out into the open. As the Cloud Computing matures, memory is going to THE component that defines the next leap forward, which is to make the Cloud work like one giant computer. 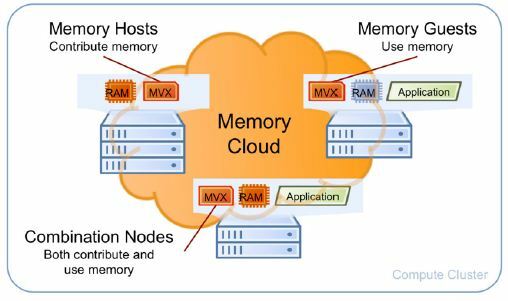 Extending the memory and incorporating memory both on-premise, on the host side as well as memory in the cloud, into a fast, low latency memory pool would complete the holy grail of Cloud Computing as one giant computer. targeted automatic tiering solution for traditional block storage. Dell is definitely quietly building something and this could go on for some years. But for the author to quote – “Ocarina will be the dedupe engine, Exanet will be the scale-out NAS engine; RNA Networks will provide cache coherency technology … ” mean that Dell is determined to out-innovate some of the storage players out there. It will be interesting how to see how RNA Networks technology gels the Dell storage technologies together but one thing’s for sure. Memory will be the last bastion that will cement Cloud Computing into an IT foundation of the next generation.